Magic Fingers Vibrato, Software Tremelo/Vibrato from DigiTech in the iStomp series. 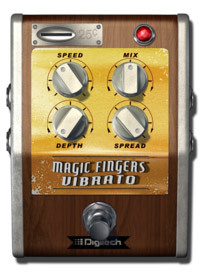 DigiTech introduces its Magic Fingers Vibrato for its iStomp programmable pedal. Magic Fingers takes a guitar signal and modulates its pitch slightly, giving it an animated “vocal” quality. The e-pedal offers stereo panning and chorusing effects. The SPREAD control changes the modulation from being synchronized in both of the pedal’s outputs to moving from left to right in the sound field, to create stereo spatial effects. The e-pedal’s MIX control enables the player to mix the dry signal back in with the effected signal. SPEED and DEPTH controls let guitarists tailor the speed of the effect "from a slow sweep to a frantic warble and from subtle pitch variation to an up-and-down sonic roller coaster." 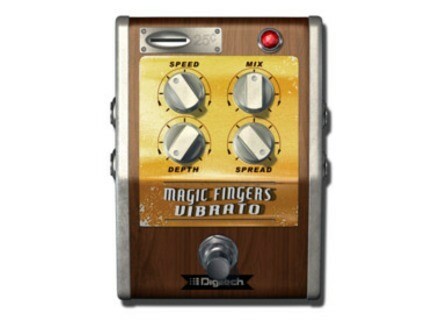 The DigiTech Magic Fingers e-pedal is now available at an introductory price of $0.99. This introductory price will run through November 12, 2012. After the introductory period the price will change to $7.99. Head to www.harman.com for more details. SPC Plugins Gater-Pro SPC Plugins has released Gater-Pro, a stereo trance gate VST plug-in for Windows with swing, variable gate shapes and switchable rate. Mecha Audio E Cue Mecha Audio has released E Cue, a new VST effect plug-in for for Windows described as a DJ-style channel strip. Synth-Project Anicontrol Mario Jurisch has created the Anicontrol controller for the Moog Animoog app: a Minimoog with an iPad inside.